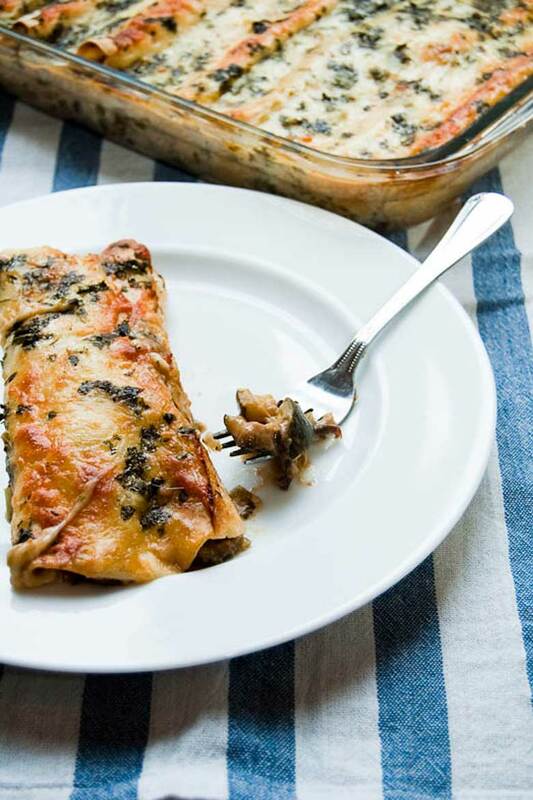 This pair of enchilada recipes (chicken enchiladas and black bean-zucchini enchiladas, both with creamy green chili sauce) gets cooked side by side in the same pan. It's a great way to feed a crowd of vegetarians and carnivores alike. This recipe is adapted from In the Small Kitchen by our friends Cara Eisenpress and Phoebe Lapine. 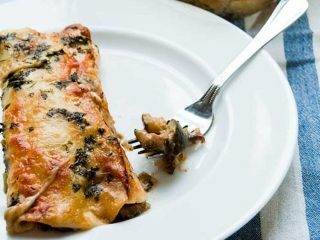 This pair of enchilada recipes is a great way to feed a mixed crowd of vegetarians and omnivores. Make the chicken filling: In a medium bowl, combine mustard, oil, chili powder, and salt. Add chicken breasts and toss to coat. Place in lined baking dish and bake for 30 minutes or until cooked through and tender. Allow chicken to cool slightly, then shred the breasts using two forks. Set meat aside, along with any juices from the baking dish. Make the black bean filling: Coat a large skillet with olive oil, place over medium heat, and sauté onion until soft, 5 to 8 minutes. Add zucchini and continue to sauté, stirring occasionally, until zucchini is tender and browned, about 6 minutes more. Add garlic, beans, chili powder, cumin, and salt, and cook for five minutes. Transfer to a bowl and set aside. Make the sauce: Wipe out the skillet with a paper towel. Melt butter over medium heat. Add garlic and jalapeños and cook until soft but not brown, about 4 minutes. Add flour and cook, stirring, for 1 minute. Add stock, raise heat to high, and bring to a boil. Reduce heat and simmer until the liquids have reduced and the sauce has become opaque, about 5 minutes. Stir in sour cream, chiles, cumin, chili powder, salt, and cayenne. Coat the bottoms of two 9×13-inch baking dishes with some of the sauce. Reserve the rest. Assemble the enchiladas: Fill 8 tortillas with the chicken and 8 with the black bean and zucchini mixture. Top the filling with a spoonful of shredded cheese and a sprinkle of cilantro. Roll up tortillas and place seam-side down in the baking dishes. Pour remaining cream sauce evenly over enchiladas and sprinkle with remaining cheese. Bake for 30 minutes, or until sauce is bubbling and cheese is beginning to brown. Garnish with the extra cilantro and the scallions and serve with lime wedges. Adapted from In the Small Kitchen by our friends Cara Eisenpress and Phoebe Lapine.